The LEGO® Movie is credited to four writers, and it feels like it. While the film’s LEGO-brick derived animation is a joy to watch from start to finish, and the characters and their banter are cute and chuckle-worthy, as a whole the film is often clunky and confusing in its message. Worst of all, it commits the unforgivable sin as far as films geared toward younger audiences: It’s slow to the point of potentially boring the kids. Perfectly ordinary and uninteresting construction worker Emmet Brickowski (Chris Pratt), who’s blissfully lived his entire life following the instructions for absolutely everything, including interacting with others, suddenly finds himself swept up in a battle for the souls of the many different LEGO® worlds that previously existed entirely without his knowledge. The megalomaniacal Lord Business (Will Farrell) is out to rid all the worlds of the chaos he sees and cannot understand with a powerful weapon called “the Kra-Gle”, which will permanently set everyone and everything according to the way he thinks they should be. Only one thing can stop Lord Business’s ambitions: a prophecy claims that one “MasterBuilder” (a LEGO person who can build anything he or she imagines almost instantaneously), “The Special”, will rise from the masses and, using the lost “piece of resistance”, forever stop Lord Business and defend LEGO people everywhere and their power to build and create whatever they choose. 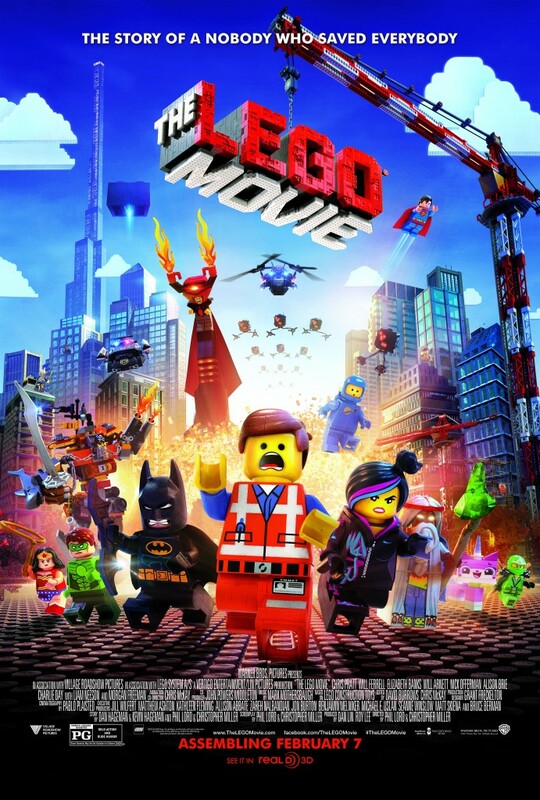 The wise and powerful MasterBuilder Vitruvius (Morgan Freeman) sent his loyal disciple, the beautiful and spunky Wyldestyle (Elizabeth Banks), out to search for “The Special” and the piece of resistance, and when she finds it attached to Emmet’s back, she believes she’s found their savior. As the oddly-matched heroes flee from Lord Business, his chief henchman Bad Cop (Liam Neeson) and their army of mechanical “micromanagers”, they rally an army of Masterbuilders of their own, with everyone from Batman and Superman (Will Arnett and Channing Tatum, respectively) to Lando Calrissian (Billy Dee Williams), Gandalf (Todd Hansen) and Abraham Lincoln ready to follow the Special. Except, well, Emmet doesn’t seem to be very creative. Or smart. Or brave. Or anything particularly useful. Doh! If the plot sounds like something a 10-year-old would concoct, there’s a reason for that in the script. If it also sounds like a wacky hodge-podge of ideas thrown together like a tower of LEGO® bricks built in the dark, there’s a reason for that, too. The film’s story is credited to four writers: veteran animation writers Dan and Kevin Hageman (Hotel Transylvania) and the minds who gave us Cloudy With a Chance of Meatballs and 21 Jump Street, Phil Lord and Chris Miller. Between the four of them, they concoct a tale that’s got real cleverness in some of the film’s running jokes, and real ambition and good intentions in the themes they explore — there’s simply too much of it. Too many jokes feel written to elicit a chuckle from the parents paying for the tickets rather than a belly laugh from the kids who play with the bricks in the first place. Worse, they can’t seem to figure out what message they want the kids to come away from the film with. The first half of the film gently satirizes conformity and the sameness of day-to-day life for the masses, but then the gears get shifted, and suddenly it’s all about the value of being able to follow directions and work as part of a team that’s getting trumpeted. So, it’s bad, then, to not conform and not follow the directions? Grown-ups in the theater might be able to piece together what the writers really mean to say, but it’s a good bet the Under-10 years-old set sitting there waiting for the next gag where a LEGO character gets knocked apart sure won’t. Visually, of course, it’s a feast for the eyes, especially if you have any affection at all for LEGO® building and the wonders it can construct. And the characters themselves are all likeable, if not very memorable. Chris Pratt doesn’t have to do much to his voice to sound like a good-natured doofus, nor does Morgan Freeman have to do anything at all to sound grave and dramatic. If anyone does any hard work here to sound different than they do in real life, it’s Will Arnett, who sounds like he’s having a blast getting his voice all gravelly to play Batman. More than likely, it’s Arnett and the numerous cameos and the jokes built around them that will leave lasting impressions. But throwing all that “more” at them haphazardly and in 3D at the audience in the hopes that what results will hold together and leave viewers satisfied is not the way to leave a lasting impression. Really, it just leaves a mess. Starring the voices of Chris Pratt, Will Farrell, Elizabeth Banks, Will Arnett, Nick Offerman, Alison Brie, Charlie Day, with Liam Neeson and Morgan Freeman. Directed by Phil Lord and Christopher Miller.